Explanation: Why does the Sun flare? Unpredictably, our Sun unleashes tremendous flares expelling hot gas into the Solar System that can affect satellites, astronauts, and power grids on Earth. This close up of an active region on the Sun that produced a powerful X-class flare was captured by the orbiting TRACE satellite. Clicking on the image should bring up a movie that shows the evolution of Active Region 9906 over about four hours. The glowing gas flowing around the relatively stable magnetic field loops above the Sun's photosphere has a temperature of over ten million degrees Celsius. 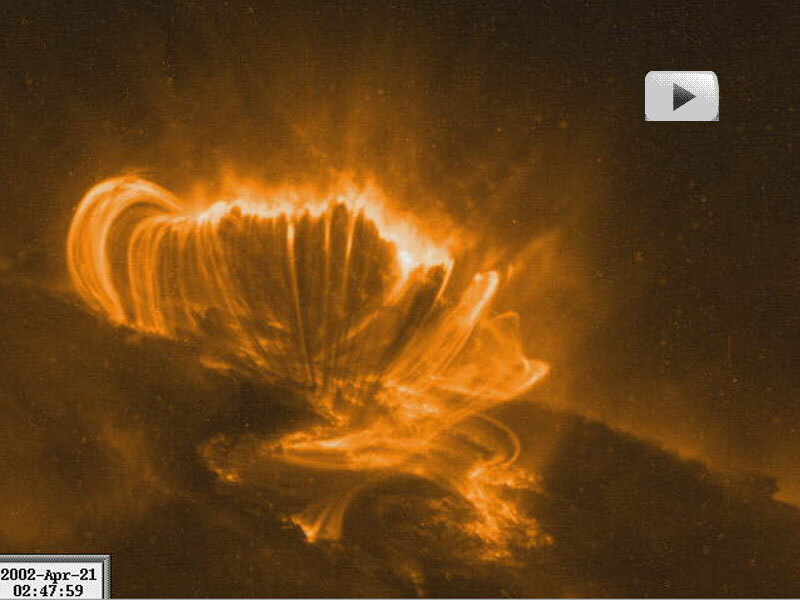 These flows occurred after violently unstable magnetic reconnection events above the Sun produced the flare. Many things about solar active regions are not well understood including the presence of dark regions that appear to move inward during the movie.